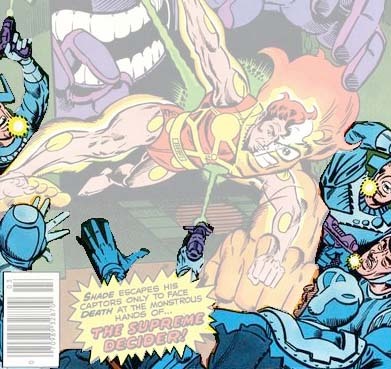 First Appearance: Shade, the Changing Man (vol. 1) #1 (June-July 1977): "Escape to Battleground Earth"
Cancelled Comic Cavalcade #2 (Fall 1978): "The Deadly Ally"
Shade, the Changing Man (vol. 1) #1 (June-July 1977): "Escape to Battleground Earth"
Shade, the Changing Man (vol. 1) #2 (Aug.-Sep. 1977): "The Forms of Destruction!" Shade, the Changing Man (vol. 1) #3 (Oct.-Nov. 1977): "Escape into...the Trap!" Shade, the Changing Man (vol. 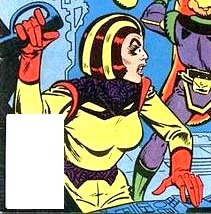 1) #4 (Dec. 1978 - Jan. 1979): "To Rescue My Destroyer"
Shade, the Changing Man (vol. 1) #5 (Feb.-Mar. 1978): "The Captive of Changing Captors!" Shade, the Changing Man (vol. 1) #6 (Apr.-May 1978): "Khaos, the Lord of Terror!" Shade, the Changing Man (vol. 1) #7 (June-July 1978): "The Color Coma!"